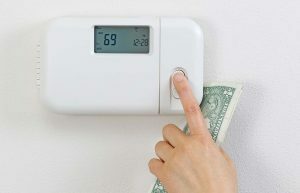 Do you feel like you are paying too much to heat and cool your home? Whether its natural gas, propane, or oil for the winter or your electric bill in the summer, if it seems too high your thermostat may be the culprit. When it comes to HVAC systems, the thermostat is often overlooked. But in actuality, your thermostat is the key to your home comfort. If your thermostat is old, it could be costing you money in ways you’ve never realized. Consider upgrading thermostats as part of your HVAC maintenance in Greensboro. Here’s why. That’s right, hundreds of dollars could be saved yearly when you upgrade to a programmable thermostat. Between $300 and $400 to be more specific, although the amount varies based on many different factors such as the weather where you live, your type of HVAC system, the size of your home, and the cost of utilities in your area. A programmable thermostat allows you to preset your system to heat or cool to different temperatures at different times of the day and night. In the winter you can lower the indoor temperature when no one is at home or during the night when you’re in bed under the covers. In the summer you can raise the temperature when no one is home and cool it down at night for more comfortable sleeping conditions. You can even set it before you go out of town. Your HVAC system uses less energy this way, which in turn saves you money. Digital programmable thermostat. This is the most basic of the programmable thermostats available. You can set it directly from the touchscreen keypad inside your home to heat or cool to specific temperatures that coincide with dates and times. Wireless programmable thermostat. This type of thermostat can be controlled remotely from your smartphone. You can program and reprogram your thermostat as needed from anywhere. The advantage here is that if your schedule deviates from normal, you can reprogram your thermostat to change the indoor temperature as needed, so that you can walk into a comfortable home. If you forget to set your thermostat before leaving town or if you plan to be back home sooner or later than originally planned, you can make the necessary adjustments. Smart home systems. These allow you to program your entire home, including your HVAC system, lights, water, security system, and more, all from your smartphone. You can be in control of every aspect of your home no matter where you are. The next time Berico comes out to give your system a tune-up, it’s a good time to go ahead and make the easy upgrade to a programmable thermostat. At the very least, a basic digital thermostat will save you money and make your life easier. The wireless thermostat and especially the smart home system will bring a whole new level of convenience and peace of mind, all while saving you money as well. Before your next appointment for HVAC maintenance in Greensboro, contact Berico to ask about upgrading to a new programmable thermostat. Call (336) 273-8663.